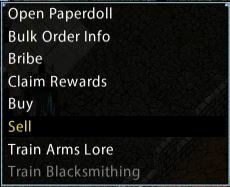 Players with at least 0.1 in the skill will have a chance to receive bulk order requests from when they left-click on the NPC, and choose “Bulk Order Info” from the context menu. 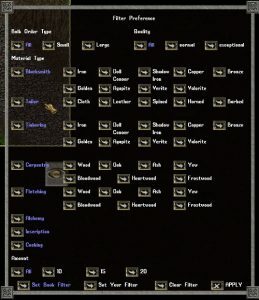 Blacksmith – NPC Armorers, Blacksmiths, Iron Workers and Weaponsmiths. Tailor – NPC Tailors and Weavers. 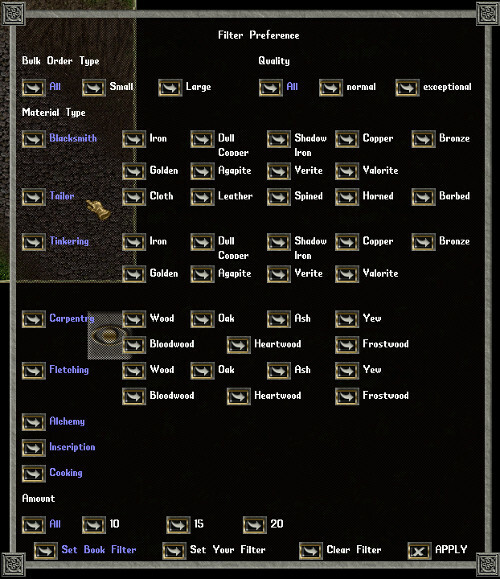 When offered, the bulk order is in the form of a deed, a different color for each skill. 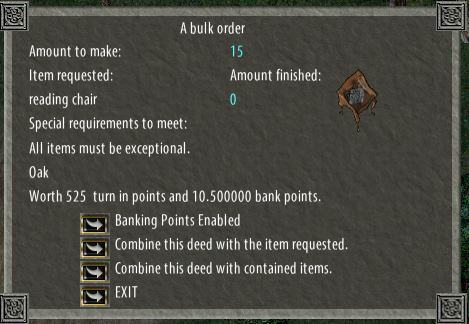 Double-clicking this deed brings up the details of the order; the item name, amount to make, quality of the item requested, and the ore or material type. All bulk order deeds are “blessed”, which means they cannot be stolen from your backpack by a thief if you are in Felucca. if your crafted items are contained in a pack within your back pack you can choose the option “Combine this deed with contained items”, this gives a targeting cursor with which you can target that pack, all the items will automatically be combined. 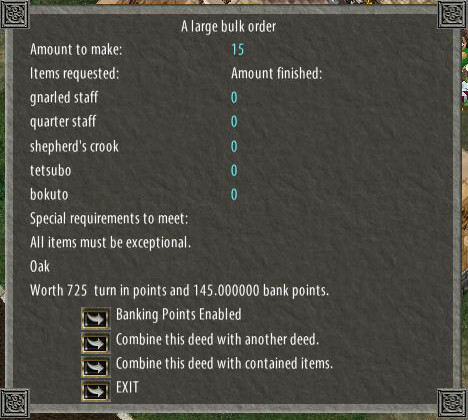 Choosing the option “Combine this deed with the item requested” also gives a targeting cursor, target each of the crafted items until the request has been filled. Use this method for items that stack. The completed order (deed) can then be dropped on an appropriate NPC for a reward or combined with others into a Large Bulk Order, however before claiming your reward you may wish to decide whether to toggle the option “Banking Points Disabled” (Enabled). It is not necessary to return the deed to the NPC you received it from, as long as the NPC you choose is one that will give that type of BOD. 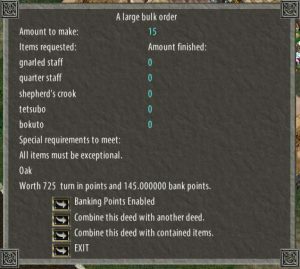 Items cannot be removed from a deed, once they have been combined with it. 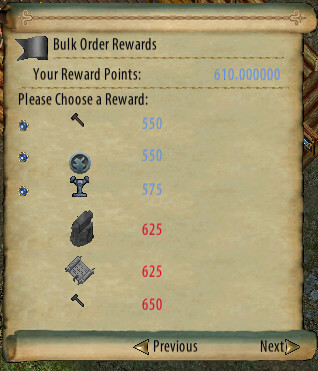 Small bulk orders are the primary type of BOD received if the crafter is 70 skill or higher. If the crafter is less than 70 skill, the requested BODs will ALWAYS be small BODs. Large bulk orders (often called LBODs) are less frequently obtained and difficult to fill, in that each large bulk order requires filling several small bulk orders of the requested types, and then those completed small BODs, are combined with the Large BOD in the same manner as items are combined with a small. Taking the example pictured below, 5 small BODS must be combined into it to fill it. They must exactly fit the request, ie 15 items of the correct type. Normal (non-exceptional) deeds may be filled with exceptional items. Exceptional deeds may be filled only with exceptional items. The rewards are threefold. The first reward is gold. Large BODs have a set gold value by type, while small BODs give gold equal to half its vendor’s value (So, if an object is valued at 200 gold outside, then it would yield 100 gold multiplied by the requested amount). The gold amount is credited directly to the character’s bank balance. The second reward is an amount of fame, which is based on the point value of the deed. 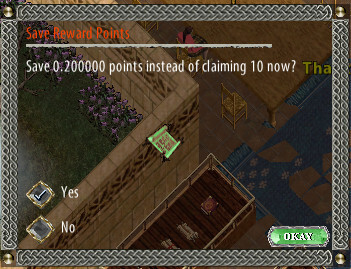 The third reward is a number of points which can be used to claim a special reward, or a small percentage of the points can be banked. At this point select on your bod your choice for the ‘Banking Points’ option. When the option is set to ‘Automatically’ and a BOD is dropped on the npc the points are banked without the need to confirm the action. Tick ‘no’ to proceed to the reward menu or ‘okay’ to bank the points. Hitting the ‘enter’ key on your keyboard will also ‘okay’ the action. When the option is set to ‘Disabled’and a BOD is dropped on the npc you will be taken straight to the reward menu. In order to make storage of the large amount of bulk orders, Bulk Order Books have been created. The books act as a container that can hold only bulk order deeds, all relevant skills, deeds of all sizes and types. A bulk order book can hold up to 500 orders. The Book and the first 4 orders in it count as 1 item. For every 5 orders above the initial 4 (and fractions thereof), it will counts as one extra item, so when it’s filled it will count as 101 items. Items may be added or removed if the book is in the character’s back pack or locked down in a house to which the character has required access. 1) Place the book on a vendor and set it to “not for sale”, then set a price for the individual BODS. The book will allow the buyers to buy single orders from within the book at the price specified. The filtering options are of course also available to potential buyers. 2) Place the book on a vendor and set it to “not for sale” but do not set prices for the BODs. This is a legitimate form of storage for BODs only.